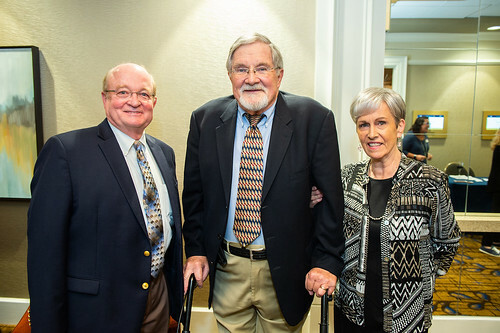 Three outstanding alumni and ambassadors of Auburn University’s College of Veterinary Medicine were honored Oct. 19 at The Hotel at Auburn University and Dixon Conference Center by the college for their distinguished professional careers. Patricia Kennedy Arrington ‘71, Robert Hoyt ’74 and Steven Swaim ’71 were recognized as the 2018 Wilford S. Bailey Distinguished Alumni. The award is the highest honor given to College of Veterinary Medicine alumni to recognize their accomplishments in veterinary medicine, outstanding contributions to his or her community and the advancement of animal and human health. The award is named to honor the late Wilford S. Bailey, who held a 50-year continuous faculty appointment at Auburn, serving in positions ranging from instructor to university president. A 1942 graduate of the college, Bailey was the first recipient of the Distinguished Alumnus Award. Following his death in 2000, it was named for him. The awardees were recognized in three different areas of eligibility for the awards; academia, private practice and research and public policy. Kennedy Arrington is the co-founder and owner of two veterinary practices in Louisville, Kentucky, the Jefferson Animal Hospitals, which includes the Fern Creek Wellness & Surgery Center and the Outer Loop 24-hour Emergency Center. Both are considered among the top practices in the state and beyond for their commitment to animal care and the human bond. Both practices are operated using fear-free and low-stress techniques, ensuring the pet and their owner a positive experience. “We believe that gentle handling and compassion, not muscling down the animal, will go far in how the animal feels about us and especially ensuring the owner will return their pet for health care visits,” she said. Hoyt, who currently serves as the Animal Program director and attending veterinarian with the National Cancer Institute-Bethesda Lab Animal Science Program, spoke also about giving back. Swaim, former director of the Scott-Ritchey Research Center at the college, also talked of his lifelong and deep ties to Auburn University and to the community. The Auburn College of Veterinary Medicine has recognized, from left, Robert Hoyt ’74, Steven Swaim ’71 and Patricia Kennedy Arrington ’71 as the 2018 Wilford S. Bailey Distinguished Alumni.